William Quincy Belle: Robin Williams: How Should We Face the End? As I sit here writing this, I have to think that it’s been a great day. I went for a walk; I enjoyed the outdoors, and had the feeling that all is right with the world. And I would add, if it isn’t obvious, suicide is the farthest thing from my mind. The initial round of articles after the suicide of Mr. Williams focused on depression. If he had only gotten the help he needed, this wouldn’t have happened. However, a week after this news item, an article mentioned he had been diagnosed with Parkinson’s disease. Mention of PD makes me think of Michael J. Fox who, despite this life changing setback, continues to function even working as an actor. But is the disease the same for everyone? PD first affects the motor functions, but later dementia can take hold. My aunt suffered from PD and spent the last two years of her life brain-dead. What did Mr. Williams see in his future after being given the news? According to the Wikipedia article on the actor: An examination of his brain tissue revealed the presence of "diffuse Lewy body dementia," which may have been misdiagnosed as Parkinson's disease. Was Mr. Williams already suffering from the early stages of dementia? From Wikipedia: George Henry Sanders (3 July 1906 – 25 April 1972) was an Academy Award-winning English film and television actor, singer-songwriter, music composer, and author. His extremely heavy English accent and bass voice often led him to be cast as sophisticated but villainous characters. He is perhaps best known as Jack Favell in Rebecca (1940), Addison DeWitt in All About Eve (1950), King Richard the Lionheart in King Richard and the Crusaders (1954), and the voice of the malevolent tiger Shere Khan in The Jungle Book (1967). His career spanned more than 40 years. Sounds impressive. But, he committed suicide. In his later years, Sanders suffered from dementia, worsened by waning health. He can be seen teetering in his last films, owing to a loss of balance. According to Aherne's biography, he also had a minor stroke. Sanders could not bear the notion of losing his health or needing help from someone else, and he became deeply depressed. At about this time, Sanders found he could no longer play his grand piano, which he dragged outside and smashed with an axe. With age come physical limitations. There is no prettying this up. Our health goes. The wheels fall off the wagon, and what was no longer is. Do we all adjust? 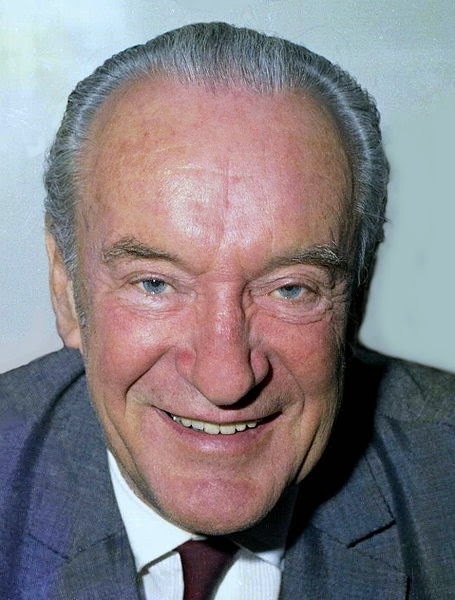 David Niven wrote in his second autobiography, Bring on the Empty Horses (1975), that in 1937 his friend George Sanders had predicted he would commit suicide when he was 65. At the age 84, Ms. Bennett took her own life on August 18, 2014. (CBC) She was diagnosed with dementia three years previously, and as the disease took its toll, she weighed her options and came to a decision. She posted a 1,699 word letter on the Internet explaining herself. I will take my life today around noon. It is time. Dementia is taking its toll and I have nearly lost myself. I have nearly lost me. Dementia gives no quarter and admits no bargaining. ... Ever so gradually at first, much faster now, I am turning into a vegetable. ... There comes a time, in the progress of dementia, when one is no longer competent to guide one's own affairs. I want out before the day when I can no longer assess my situation, or take action to bring my life to an end. According to the story, this woman had terminal brain cancer and moved to Oregon to take advantage of the state’s Death With Dignity Law. She died on November 1, 2014 at the age of 29. 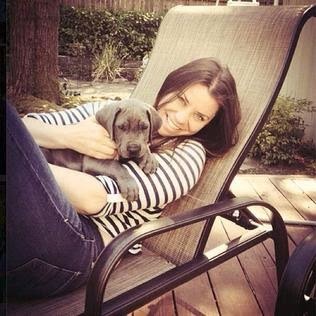 This opened a public debate on the issue of assisted suicide and her CNN article poignantly gave her side of the story. Nevertheless, there were those who were against the decision and even the Vatican condemned it. Brittany’s mother was quoted as saying, "My twenty-nine-year-old daughter’s choice to die gently rather than suffer physical and mental degradation and intense pain does not deserve to be labelled as reprehensible by strangers a continent away who do not know her or the particulars of her situation." She was diagnosed with cancer in July, 1996 and died on January 28, 1997. She managed to make it to Christmas, her last Christmas with her family, but quickly went downhill afterwards. The last three weeks of her life were spent curled up in the fetal position shaking from the constant pain. Despite the medication, it was clear she was in agony. In 2012, I suffered the worst sports injury of my life, completely traumatising the upper left quadrant of my body. I stayed pretty much locked up in my apartment for five months in pain twenty-four hours a day. I became very familiar with the idea of chronic pain. Every single day focused on pain management. Nothing, absolutely nothing else had any major importance. Not my job, not the news, not even the weather. I still can’t believe I managed to get through this. Despite the medication, there were times when the pain was so great, my over-riding thought was how I am going to get through the next sixty seconds. I still can’t believe pain can be that intense and last that long. It was hell on Earth. 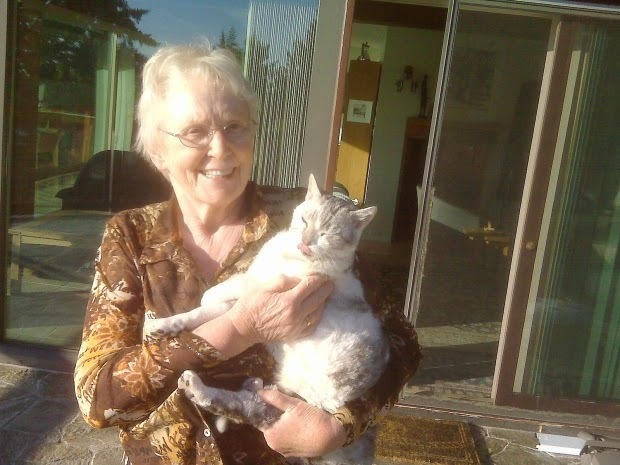 The last three weeks of my mother’s life were unnecessary. I now know her entire attention was focused on dealing with the unrelenting pain caused by the cancer. You may say there’s medication for this, but I know from my own experience that pain medication is like an umbrella in a torrential downpour. You keep some of the rain off you, but you're still getting soaked. If my mother had been a dog, the vet would have recommended putting her down. She suffered immensely and for what? The joke is that society treat pets more humanely than people. Dad died in 2004 from a heart attack. He went into the hospital on a Sunday evening and died 48 hours later. The doctor told me that his heart had suffered a major trauma and was only working at fifty percent of its normal rate. If my father lived, he would be with greatly diminished capacity. Probably, he couldn’t walk more than ten feet without having to sit down and rest. All this for a man who played golf. Mercifully he died. He had signed a living will asking for no heroic efforts be made in keeping him alive, so when his heart gave out, we let him go. It was sad, but it was the better thing to do. My aunt was diagnosed with Parkinson’s disease. The condition got to a point where she spent the last two years of her life in a vegetative state in hospital. It was determined that her brain had ceased to function, but the body lived on. Uncle Brad, her husband of fifty years, went to visit her every day for those last two years. Mercifully, she finally died. It was merciful for her and for her family. But, what was the point? This 1981 film tells the fictional story of sculptor Ken Harrison who becomes quadriplegic after a car accident. Think about that. As a quadriplegic, you have lost all voluntary muscle action from the neck down. You are totally dependent on others to live. No longer able to create art, Harrison sues for the right to end his life. 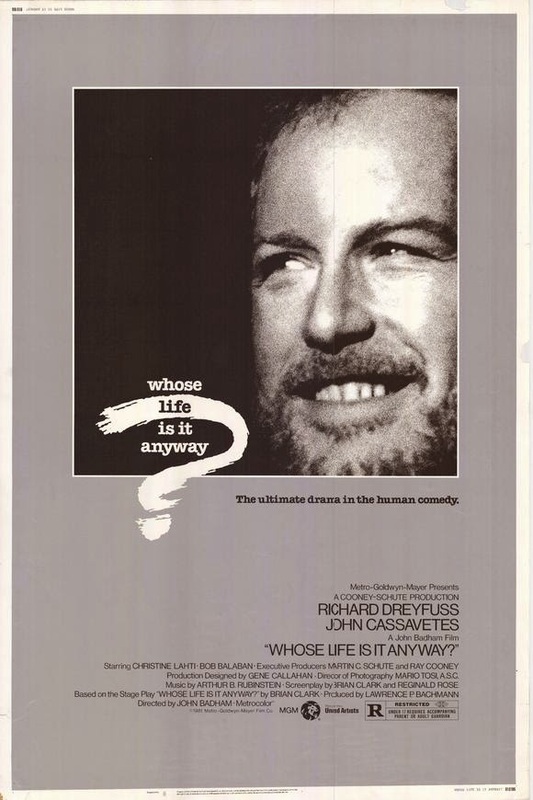 The story deals with the debate surrounding euthanasia, but in the end, a compromise is struck when Harrison wins the right to be disconnected from his kidney dialysis. No one is actively involved in causing his death. Without dialysis, a patient will die within 48 to 72 hours. We think about the preserving life at any cost. But what is the trade-off between quantity of life and quality of life? What if quantity means a poor quality? This 2011 French comedy-drama tells the true story of Philippe Pozzo di Borgo who becomes quadriplegic after a paragliding accident. Unlike the previous film, the protagonist finds something in life which makes him want to continue despite such an enormous handicap. I couldn’t help comparing this to Stephen Hawking and Christopher Reeves. Life can continue. Life is very, very different and one finds a reason to keep living. But make no mistake, you are totally dependent on others to live. The web site TV Tropes talks of a fate worse than death, which makes death a kindness. I have seen this in both war films and science fiction where good guy’s partner is hurt or for whatever reason can’t get out, so rather than leave him to the enemy and surely torture and a cruel death, good guy either leaves him with a gun or kills his partner himself. Wikipedia’s article on euthanasia defines the word as the practice of intentionally ending a life in order to relieve pain and suffering. The article delves into its history and the current debate on the topic. Is it merciful or is it murder? The big C unto itself is no longer the death sentence it was fifty years ago. Several colleagues at work have been given the diagnosis, but treatments such as chemo and radiation have given them a clean bill of health. They are back to work and living their lives. Of course, one usually says that once you have cancer, you never say that you are disease-free; you always say that you are in remission. But is that always the case? My mother was dead in six months. Uncle Ben turned 99 recently and the family gathered to celebrate this milestone. - You reach a certain age and your birthday is really about the fact that you are still alive. – Cousins Derek and Tom flew in for the festivities and we had quite a bit of time in the car going from city to city visiting people to talk at length about things. They brought up the topic of euthanasia. Derek is 70 and Tom is 67. Derek and Tom are the children of my aunt and witnessed first-hand the ravages of Parkinson’s disease. Obviously, they had been giving this topic some thought. Uncle Ben has said on more than one occasion he’s ready to go. He lives in an old folk’s home. He has so many health issues, it’s ridiculous, but he is still lucid. He’s told us to not live beyond 85. That’s enough. Of course, around 85 he lost his wife after fifty years of marriage, but he is also bringing up the point about the quality of life. He’s half-blind. He is in constant pain. He’s so weak, he needs a scooter to get around. He suffers from seizures and will collapse to the floor, ofttimes soiling himself. He’s incontinent and wears diapers. Life isn’t pretty and he knows it. Remember, he’s lucid. It might be a blessing if he had dementia and no longer knew what was going on. This is no longer fun; it is a contest to stay alive. But for what purpose? What would a vet say? Excuse me, my memory is fuzzy on this, but the story dates back to the early 1990s. I’m not sure if this was Sue Rodriguez or somebody else. The woman had ALS and I thought went to Switzerland for assisted suicide. Maybe not. Ms. Rodriguez died in British Columbia. Oprah has as guests the husband and the son of the woman. Both of them support the woman and her right to die and felt it was the best thing under the circumstances. But Oprah also has as a guest a representative of an organisation which is against assisted suicide. At the time, I couldn’t help notice that this woman was healthy, in control of her faculties, and at an age when most of life remained for her to experience. She had no personal knowledge of the problems faced by those who contemplate suicide, but argued against assisted suicide. I thought her line of reasoning was faulty and I couldn’t help wondering what she would say if she herself was dealing with any of the issues I’ve already enumerated. When the world is your oyster, you can’t see any other perspective on life. In the movie When Harry Met Sally, Harry comes over to comfort Sally when she finds out an old flame, Joe, is getting married. She’s upset Joe didn’t want to marry her. God, that scene is hilarious. Although, now that I’m 62 years old, you have to admit that “someday” is a little less vague than when I was forty. The ride is going to be over. The vacation is going to end. The theatre play is going to come to a close. It’s inevitable. It’s just the way things work and we all have to accept that our turn is going to be up. Someday. But what about that day? Do I want to spend the last two years of my life brain-dead? Do I want to spend the last three weeks of my life curled up in the fetal position constantly trembling in pain? Do I want to see my own faculties diminish to the point where I am no longer intellectually fit and must be supervised? I’m sure we would all like a fairy tale exit by going to sleep one night and never waking up. However, there is a good chance that isn’t going to happen. Society, so far, is not as humane as the vet, so do we accept the current laws of the land or do we take matters into our own hands and do what we think is best for us? Robin Williams may have been depressed. 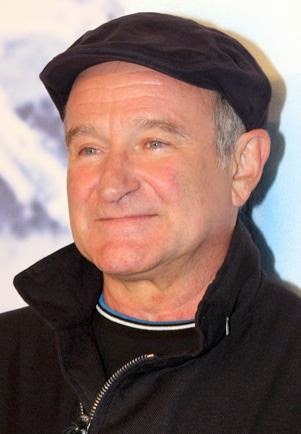 Robin Williams may have been in the early stages of a dementia-like illness. Or he may have seen the future like George Sanders and Gillian Bennett and he made his choice while he still had a choice. We stand afar on a good day. We are healthy. We have all our faculties, and life is good and full of prospects. We can’t imagine why anyone would want to end their life. It doesn’t make sense. It must be depression. Someday, my doctor may tell me I have cancer. Someday, my doctor may explain my odd behaviour as an early sign of something or other. What will I do? What should I do? At that moment, I will still be able-bodied. At that moment, I will still have my wits about me. If I hesitate, I may only make matters worse for me and for family and friends. It’s inevitable. At some point, we all have to turn out the lights and go home. 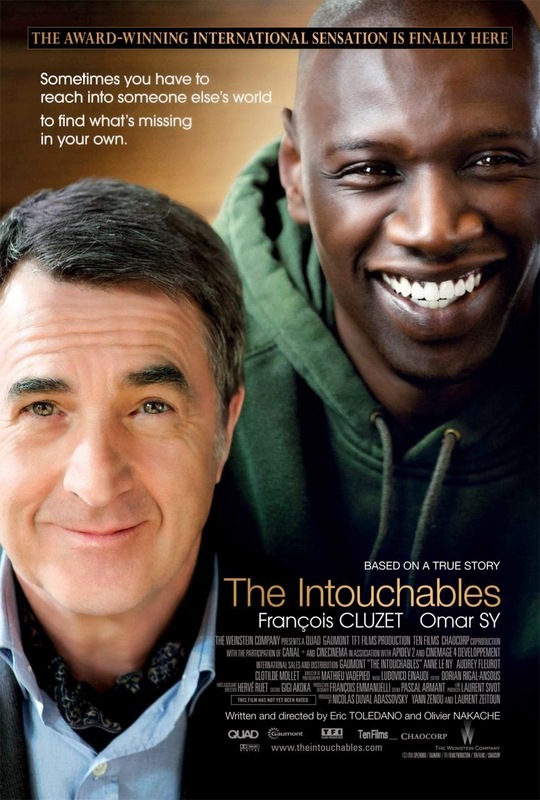 This French movie is based on a true story. In 1993, Philippe Pozzo di Borgo, director of one of the world's most celebrated champagne houses, receives the horrible news that his wife has been diagnosed with a terminal illness. Shortly afterwards, he suffers a tragic accident while paragliding and is left a quadriplegic. His wife dies in 1996 leaving Philippe alone to carry on living completely dependent on his caregivers to sustain his existence. The Supreme Court paved the way for Canada to become the 10th jurisdiction in the world to allow some form of physician-assisted suicide this morning when it struck down this country’s blanket ban on the practice. In a unanimous, 9-0 judgement, the Court determined a total ban on all forms of assisted suicide is unconstitutional, determining it should be allowed if specific circumstances are met. Those include that only a physician can assist in a suicide, the patient must be a competent adult who clearly consents to have their life end, and who has a "grievous and irremediable medical condition (including an illness, disease or disability) that causes enduring suffering that is intolerable to the individual in the circumstances of his or her condition." "The prohibition on physician-assisted dying infringes on the right to life, liberty and security of the person in a manner that is not in accordance with the principles of fundamental justice," the ruling states. Thanks for this thoughtful post. I'm just a fan, of course, but have been really struggling with the death of Robin Williams. Beyond missing that great talent in the world, I've been actively bothered by what must have been going on with him. The "just depression" angle never seemed right. The PD announcement gave a little more context, though it too didn't seem enough. Evidence of Lewy Body dementia, a possible misdiagnosis of PD and whatever medication compounding that on top of an underlying chronic depression seems a far likelier and murkier culprit. A tangled mess none of us really want to experience. I don't know his thoughts, of course, but can only imagine that such a brilliant, sharp mind as his, coupled with a body capable of frenetic movement, wanted nothing to do with the deterioration he understood coming his way. The only comfort I can find is the knowledge that he probably dodged a huge ugly bullet. And, of course, as a society we have no way to effectively manage this. We do treat our dogs better than we treat our parents at the end of their lives. It's practically drilled into us as a mantra that of course we should grab for every single medical procedure there is as though they offered actual cures and not just prolonging the agony, if not actually offering up a whole new round of side effects. Given the hold of religion in this country as a primary "pro life" driver, it seems unlikely that we'll ever get good traction on sound social policies for transitioning to death with dignity. I enjoyed reading your thoughts on the matter.